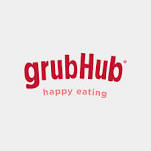 My favorite FREE app this week is Grub Hub- a take out ordering app. Go on Grub Hub, put in your address and up pops dozens of restaurants that will deliver to that address right now. It asks you “What you would like?” which can narrow the search. You can indicate certain restaurants as favorites, look up past orders, view menus and more! Once your order is placed, Grub Hub sends you a message telling you your food is on its way and what time you can expect it to arrive. There are even opportunities to earn FREE GRUB. There is no charge to use Grub Hub- only the delivery fee that the restaurant charges. Check it out; it works like a charm!